The most unique Big Marlin competition in the world! Patterned after the golf format, the base purse is available each fishing day to the largest marlin weighing 500 lbs or more. If no one catches a marlin of that size, the day’s purse rolls over and is added to the next day’s purse. $194,100.000 was awarded to Team Ihu Nui in 2017 with a 731.5 pound blue marlin by Robert Rosado. 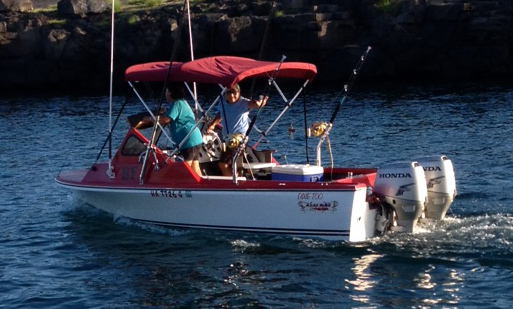 July 4th 6PM – Pupus, Registration and Team Briefing at Hawaii Big Game Fishing Club. Follow the links below to access the contest rules. To register, please download and complete the Team Entry Form and select a payment form according to your preferred method of payment. Mahalo. All HMTS Tournaments abide by the International Game Fishing Association’s International Angling Rules – Rules for Fishing in Fresh and Salt Water. A copy of these rules is supplied to each team prior to fishing and is also available HERE>. 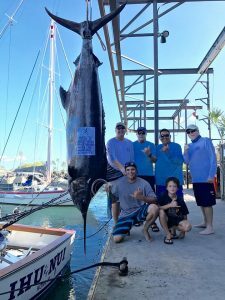 Robert Rosado stands next to his 731.5 pound blue marlin, along with Team Ihu Nui compadres – Capt. McGrew Rice, Carlton Arai, Kaulike Rice and fellow angler David Andersen. Skins fishermen are looking for marlin bigger than this “typical” Kona sport fishing vessel. Last year team “Foxy Lady” won $196,350.00 with 7 marlin tagged and released when no one caught a marlin over 500 pounds.